« All the gear, but any idea? Yesterday afternoon I hit the road with the mission of searching for populous areas of canola and a nice part of Victoria with some wind farms. I usually try and get out every spring to shoot canola fields at various areas around Melbourne and Victoria. Up until now I’ve shot on the way down to Geelong. Below is a shot I took last year near the town of Little River near the You Yangs just after sunrise. I saw a post a little while ago that featured this area and I have to thank ST Photographics for the heads up on the amazing area. Be sure to check out a post on their site here. I’ve never really had the opportunity to shoot wind farms before, once I tried in Tasmania but when we got there it was private tours only so I was stoked to be able to get so close to these giant beauties! See below for a map of where I took all of the following shots. The area I focused on was just south of Waubra a little to the west of Ballarat and around 1 hour 40 minutes from Melbourne depending on where you choose to come from! I started at the town of Windermere just south of the Western Highway and then worked my way towards Waubra. Obviously seeing canola is season dependent so if you head here in mid-September you’ll have a good chance of seeing yellow fields everywhere. I’m not too sure when they’re harvested but you wouldn’t want to leave your run too late or you’ll be left with nothing but brown which doesn’t look all that great! I don’t often jump fences to shoot certain scenes but I’ll admit I did in the case of the canola below. I like to be able to have a strong point of interest so this windmill stood out to me! I had just purchased a new wide angle, the Canon 16-35 f4 L IS and was super keen to try it for the first time. I’ve upgraded from the old 17-40L which lasted me a lot of years. After doing a few simple tests I can already tell that this new lens is pretty amazing! Super sharp, not I think it’s time to upgrade my 24-105L which is a bit overdue. More on that another time! I use LEE Filters in all varieties, today I focused on using the Circular Polariser, the 0.9 ND Pro Glass Neutral Density filter and occasionally the 6 stop Little Stopper. I would have liked to have used my Big Stopper but unfortunately I crushed it in my bag overseas earlier in the year and am yet to buy a replacement. There were certain backlit instances where I also used my grad NDs in both 0.6 and 0.9 strengths. The below was taken using my 16-35, polariser & 0.9 ND to get an exposure time of 1 second. 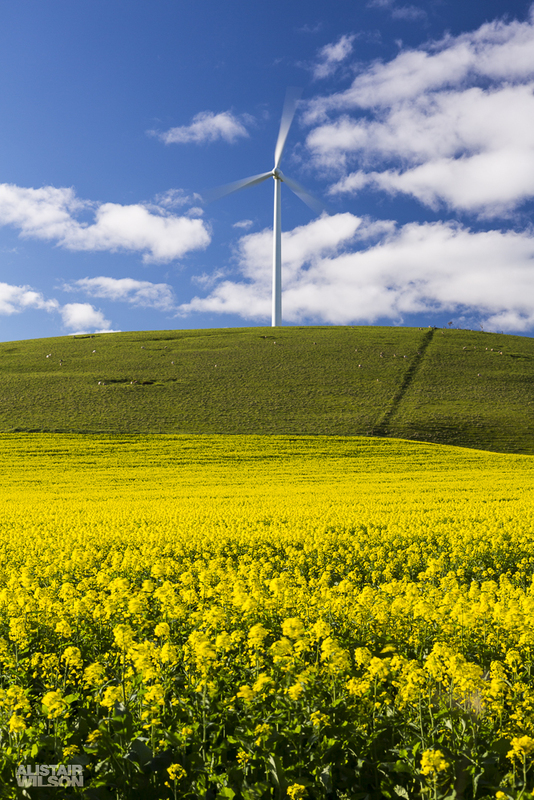 I wanted to show the rotation of the windmill as well as the canola moving around in the wind. I basically left my polariser on all day to shoot the canola as it really adds a nice amount of contrast and makes those clouds and yellows/blues really pop. Remember the polariser will be strongest 90 degrees to the sun. In the below instance I combined the Little Stopper with the polariser and the 0.9 ND. Can you tell I really miss my Big Stopper!? This allowed me to achieve an exposure of 46 seconds, f14 @ ISO 50. 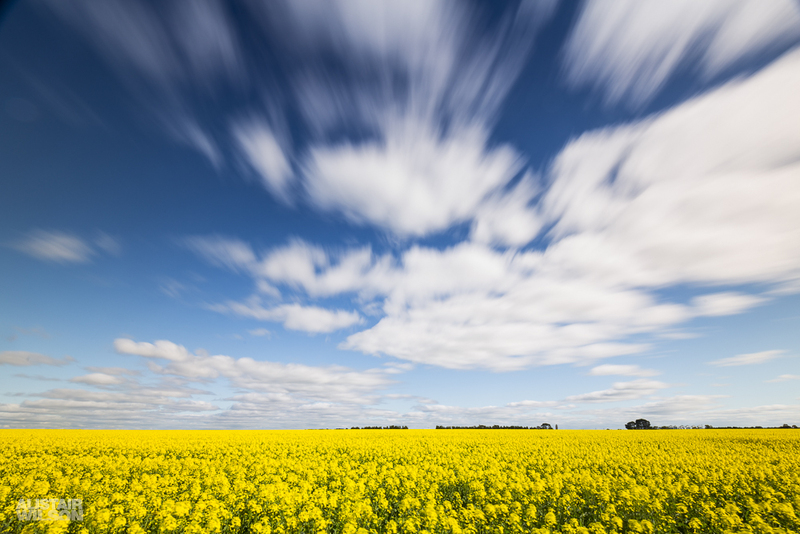 Here’ another one with the same filters minus the Little Stopper with more of a focus on the motion of the canola..
After checking out this part of Windermere I jumped back in the car and headed for the Beaufort-Waubra Road. On this road and on the roads running off it was where I took all of the next series of shots. This was my first time shooting wind farms and so it took a bit of fiddling around to get a nice shutter speed. I wanted to show that the blades were moving but so that they completely disappeared. The below was a 30 second exposure in which the blades can’t be scene, I found even a second or two and it was too long. For most of my shots I went for somewhere around between 1/6th of a second (no slower) and 1/15th of a second. It obviously depends how fast the blades are moving as well, it was quite windy on this particular day so the blades were spinning pretty quick. I shot a few panoramas as well whilst I was out there. If you’re going to attempt one with stitching different shots and you’re using a polariser try and avoid wide angles or you’ll get a really uneven sky. It can be corrected some what with graduated filters in post processing but can be a pain! I always try and shoot in a few different configurations when I shoot, don’t just shoot landscape, try vertical compositions as well and panoramic shots. You never know what you might need it for! 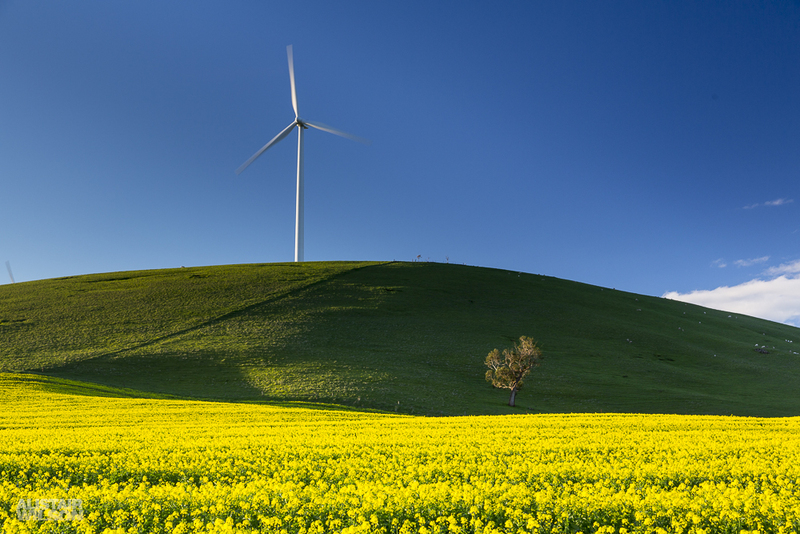 The below is from the exact same spot but zoomed in further focusing on the canola and the wind farm on the top of the hill, I excluded the tree for a clean composition. I shot at 1/8th of a second to show a slight amount of blur in the blades. I jumped back in the car and went to find the next potential spot, as I just passed the next fence I saw a cow nice and close to the road so jumped super quick and manage to fire two frames where he was looking straight at me. He then ran in the opposite direction shortly there after. 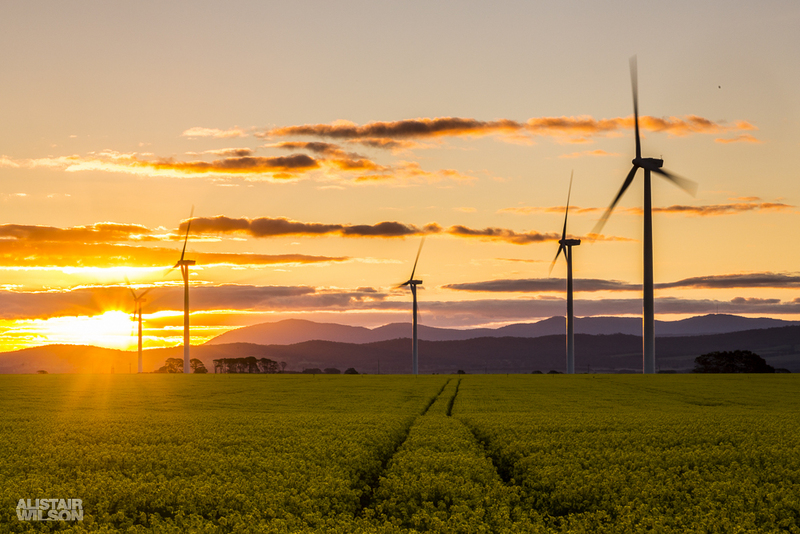 I spent the next little while driving around in circles off different roads, on the Beaufort-Waubra road I found this awesome scene with rich brown dirt and green rolling hills with wind turbines in the distances and a leading line into the field. It was perfectly at 90 degress to the sun as well so nice and side lit and the polariser was the perfect choice. I also took the opportunity to fire of a few frames for a panorama, I still think I prefer the above shot though. Let me know what you think! I spent a good little while here but it was getting closer to sunset time, I had found a field before that I thought would be a good spot to shoot it from. On there way I remember seeing this particular tree and as the sun was moving further to the west the top of the tree was lit perfectly against the shadows of the hill behind. Just my luck! Below is probably my favourite shot of the day. Time for sunset! These next ones were taken on loaders road and I had the ability to shoot from both sides of the road with the light coming from behind me in this next shot.. I had to be careful not to frame the shot too low or my shadow ended up right in the middle, the road through the centre was a nice leading line and the sheep lit up as little dots of warmth on top of the hill. Then it was time to relax and watch the sunset over the surrounding hills. What a spectacular part of Victoria! I pointed to the left for the below as there really was some nice colour in those clouds, to fit them in I had to go for a portrait composition. I’m a sucker for a bit of starburst like below so I stopped down to f22, whilst the image may not be super sharp it still gives a nice effect. I hope you liked the post and enjoyed the images as much as I did taking them! If you’re looking for a cool place for a day trip this part of Victoria is certainly worth checking out, especially in Spring when the fields turn to yellow! If you have any queries feel free to leave a comment below. Cheers! 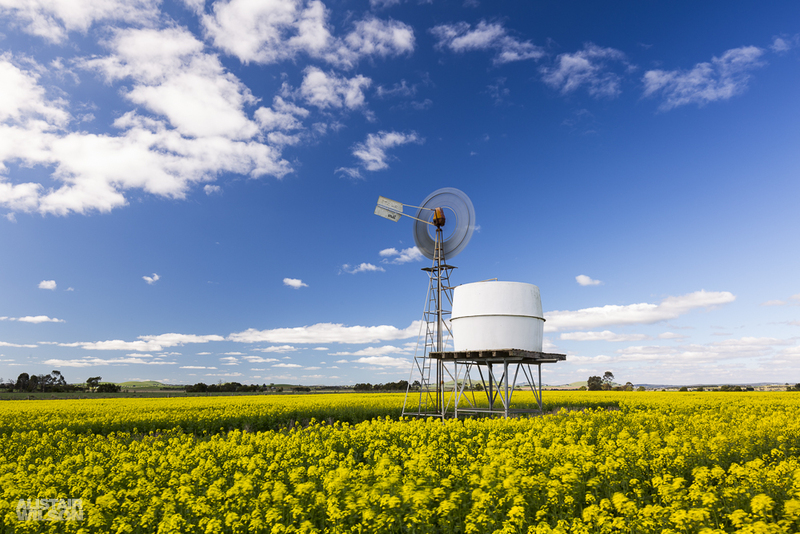 This entry was posted in Blog and tagged adventure, australia, ballarat, beaufort, blog, canola, canon, clean, energy, farms, filters, lee, lee filters, lexton, photography, polariser, post, road, travel, trip, turbine, victoria, visit, waubra, wide angle, wind, windermere, yellow.